Home Articles Thoughts from the Wall A Lament for America – Woe Unto Her! 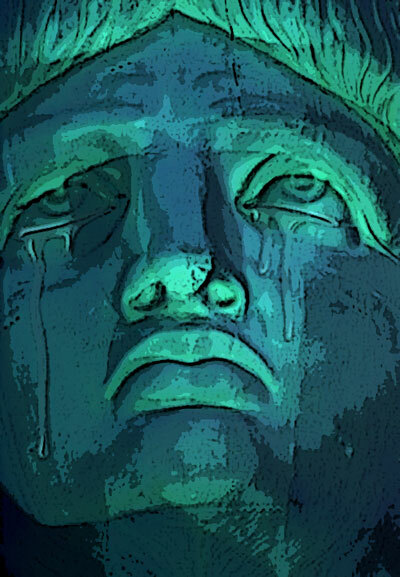 Lament for America. Woe Unto Her! The Daughter of Babylon Rises! America’s land was once spacious and free. …with God’s grace shed for thee. …her bright lamp to the world. …and her strength was His way. …now her path is astray. …as she enters the night. …that she’s lost the good fight. …with her lust without shame. …with the lies she proclaims. …with a path to a grave. …to all those she enslaves. …by the blind and naïve. …for the crumbs on their ears. …with dim eyes that can’t see. …is a party with tea. …and took hold of things wrong. …and disgraced her old song. …thrust her brood in a chain. …that they’re headed for pain. …of the red, white and blue. …will no longer be true. …but few see or have fear. …when they all will shed tears. …that they were all fools. …at the Bill of their Rights. …soon the land will ignite. …at the rise of the Beast. …oh land, you should mourn! …she’ll tread with great wrath. …who walk in the path. …and change into a Beast. …to destroy the Mid – East. …as it sees her display. …justice thrown to the wind. …a new night will begin. …and she’ll shackle the free. …they’ll writhe in her pain. …she’ll eat flesh for gain! …as they cry in the night. …that they feel her foul bite. …that through her, they’ll be well. …it’s a challenge to flee. …Her spies have a key. …will bring poison from Hell. …will be summoned and called. …many hearts will get mauled. …who can stand in its wake? …there is so much at stake. …and a storm will unfold. …and will walk into night. …and fight the good fight. …weighed down with their sin. …it is time to begin. …the one wounded in tears. …and He’ll heal the lost years. …make this the Lord’s Day. A word for the people.